BRANDON, Man. – Kevin Koe and Team Alberta (3-0, Calgary) shook off first-half struggles to score nine points in the final three ends and rally for a 12-7 win over Terry Odishaw and Team New Brunswick (1-2, Moncton) Monday morning at the Tim Hortons Brier, presented by AGI. 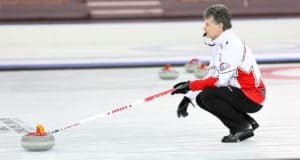 The three-time Tim Hortons Brier champion gave up a steal of three in the fourth end when his last-rock draw wrecked in the 12-foot to fall behind 5-2. But the veteran Koe, with third B.J. Neufeld, second Colton Flasch, lead Ben Hebert, alternate Tom Appelman and coach John Dunn, didn’t panic and eventually turned the game around. His draw, he said, had the right weight but the wrong line. 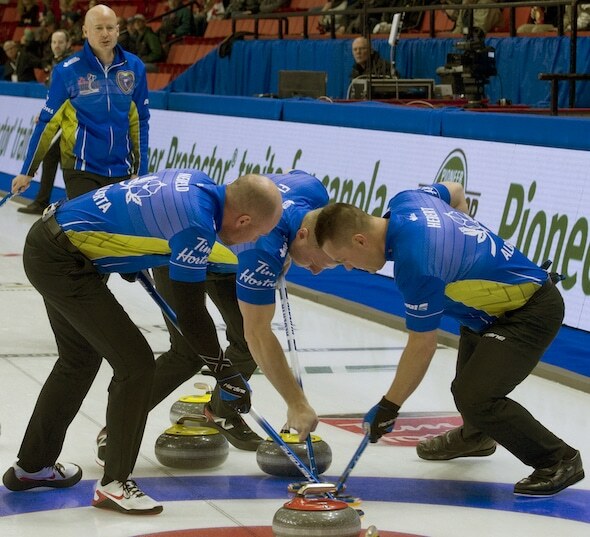 After an exchange of singles the Alberta crew began their comeback with three in seventh on a perfect tap-back by Koe, added two in the ninth and put an exclamation mark on its comeback with a steal of four in the 10th. 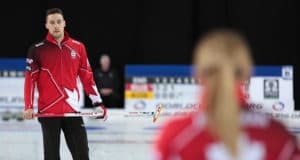 “We did a good job hanging in there and making him have some tough shots at the end,” said Koe, who said he remained confident through the game because of the five-rock Free Guard Zone rule. The win kept Alberta atop the standings in Pool B, tied with two-time defending champion Brad Gushue and Team Canada (3-0, St. John’s) who built an early lead and cruised to a 10-4 win over Jim Cotter and Team British Columbia (2-1, Vernon). 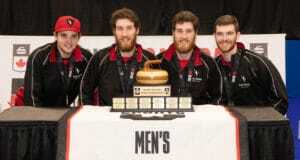 Scott McDonald of Team Ontario (1-2, Kingston) had a pair of three-enders to record his first Tim Hortons Brier win, 9-2 over David St. Louis and Team Nunavut (0-3, Iqaluit). The 2019 Tim Hortons Brier continues with draws today at 2 p.m. and 7 p.m. (all times CST).